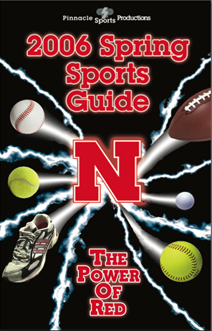 This is an example of a commerical print product, distrubuted by the Husker Sports Network (prior to changing their name from the 'Pinnacle Sports Network') during late winter and spring of 2006. As noted in the Producer's section of this website, when Shawn was hired by the Network in January of 2006, the job position he officially was hired for was simply "Producer" - which would have been fine, if the Network had also employed an "Executive Producer" to oversee all daily production tasks for the Network. Since that pressing need was available, and Shawn's prior abilities displayed an aptitude for responsibility, Shawn was instantly drafted into a position of leadership. As the new "Executive Producer" not only was Shawn tasked with being responsible for all audio programming for the Network, but he also became responsible for overseeing its publications - including the 48-page "2006 Spring Sports Guide." Unfortunately, the Network staff also didn't include a layout artist, or graphic designer, and only included a handful of sports broadcasters. In order to complete the massive task of building and publishing a 48-page sports guide in under eight weeks, Shawn had to interview coaches, write content, create graphics, design ads, design the look and feel of the guide, and set all elements of the layout. This also included coordinating with the the primary vocal talent for the Network at that time, Jim Rose, who also wrote two major pieces of content for the guide. Shawn had to edit those commentary pieces, coordinate with sales and with a printing company for the production of the publication. Shawn performed all of this while also overseeing all audio programming duties for the Network. As you can see from the full-production PDF of the guide at right (***Warning - Large file size, 84MB. Be aware - download may take extra time), details were very important for the Network's primary client, the University of Nebraska-Lincoln Athletic Department. That kind of attention to detail can not only be seen in the graphics and layout of the guide, but also in the writing of content for the guide. 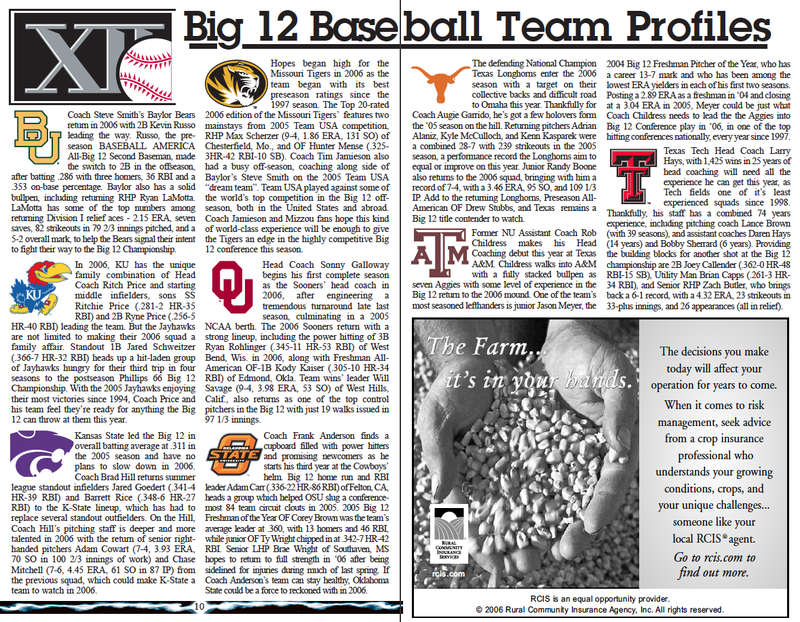 As you can read for yourself below, one of the major sports featured in the guide was the Husker Baseball team. As a key feature, team profiles for all of the other nine other teams in the league that played baseball were also a key focus in the guide. Feel free to read the guide pages below, or click on them for a two-page PDF version, for easy reading on phones and tablet devices.